Nervous about presenting your research in front of an audience? Scarred by experiences of “death by bullet point”? Learn from the experiences of three LLED faculty members and seasoned conference participants! Doing excellent research and being an excellent presenter require very different skill sets. 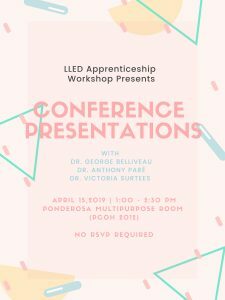 Join us for this interactive panel discussion in which Dr. Anthony Paré, Dr. George Belliveau and Dr. Victoria Surtees will share their experiences of the good, the bad and the ugly of academic presentations! Thinking of applying to the 2019 LLED Grad Student Conference? 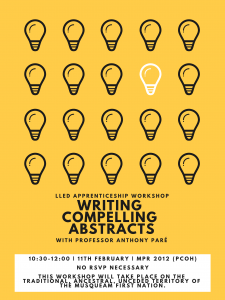 Take the pain out of writing your abstract and pick up some career skills along the way by joining us for this LLED Apprenticeship Workshop! Getting accepted to present at a conference is entirely dependent on the strength of your abstract. Condensing your work into just a few hundred words is not easy but the real challenge is making those words compelling. Luckily, there are a number of rhetorical tricks we can use to draw reviewers in and show them the importance of our work. Edit your abstract, ready for submission.